If you’ve ever wanted to know more about local community programs and initiatives, you are in luck. Starting Tuesday, January 15, Your TV will feature the United Way of KFL&A on their new weekly show entitled Limestone Lens. The program, produced by Your TV’s Curtis Brunet and hosted by Donna Chambers offers insight into the Kingston community. The show is broken up into five minute segments and will feature the United Way and Community Foundation of Kingston and Area every week as well as other groups in the community like the Memorial Centre Farmer’s Market, arts and entertainment groups and more that will appear as events and programs pop up. 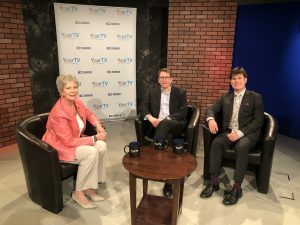 The initial episode will feature two familiar United Way faces – 2018 Campaign Chair Fred Godbille and 2017 Campaign Chair Pat Murphy – and will look at the success of the most recent campaign, but also what the United Way does throughout the rest of the year. In the coming weeks, look for features on upcoming events like the Next Gen Masquerade, a look at different programs that United Way runs, and agencies that benefit from the funds raised throughout the campaign each year.